V. Tesař, and J. Šonský, Method of diverting a fluid flow in dependence on an electric control signal and a device for performing this method. CR Patent 305 352, 2013. F. Hauksbee, "An account of an experiment touching the different densities of the air, from the greatest natural heat, to the greatest natural cold in this climate", Philos. Trans. R. Soc. Lond., vol. 26, pp. 313-324, 2017. V. Tesař, Pressure-driven Microfluidics., Artech House: Boston, USA, 2007. V. Tesař, "Fluidic control of reactor flow–Pressure drop matching", Chem. Eng. Res. Des., vol. 87, pp. 817-832, 2009. 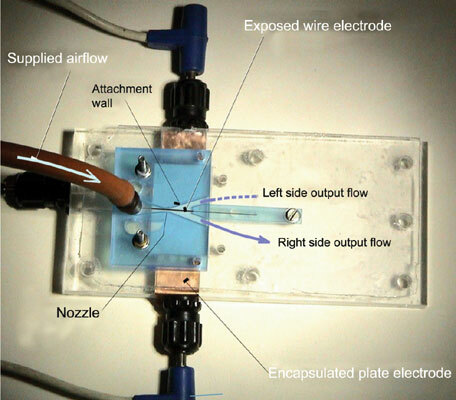 V. Tesař, S. Zhong, and R. Fayaz, "New fluidic oscillator concept for flow separation control", AIAA J., vol. 51, pp. 397-405, 2013. W.B. Zimmerman, V. Tesař, S. Butler, and H.C.H. Bandulasena, "Microbubble generation", Recent Pat. Eng., vol. 2, pp. 1-8, 2008. W. Siemens, "Über die elektrostatische Induction und die Verzögerung des Stroms", Poggendorffs Ann. Phys. Chem, vol. 178, pp. 66-122, 1857. F.W. Peek, Dielectric Phenomena in High Voltage Engineering., McGraw-Hill Book Comp: New York, 1915. I. Langmuir, "Oscillations in ionised gas", Proc. Natl. Acad. Sci. , vol. 14, pp. 627-637, 1928. J. Turck, “Ways and means for influencing a fluid flow along a surface, for example a surface of a wing”. FR Patent 1031925, 1951. A. Bahnson, An apparatus for generating a pressure by applying a voltage on electrodes. FR Patent 1266476, 1959. G.A. Hill, Ionized boundary layer fluid pumping system. U.S. Patent 3095163, 1963. A. Chattock, "On the velocity and mass of ions in the electric wind in air", Philos. Mag., vol. 48, pp. 401-420, 1899. V. Tesař, and J. Šonský, "No-moving-part electro/fluidic transducer based on plasma discharge effect", Sens. Actuators A Phys., vol. 232, pp. 20-29, 2015. R.W. Warren, Negative feedback oscillator. U.S. Patent 3158166, 1962. V. Tesař, "“Taxonomic trees of fluidic oscillators”, Eur", Phys. J., vol. 143, pp. 1-10, 2017. V. Tesař, "Characterisation of subsonic axisymmetric nozzles", Chem. Eng. Res. Des., vol. 86, pp. 1253-1262, 2008.